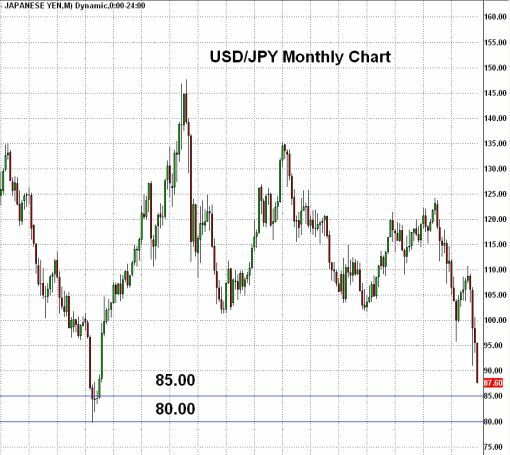 How Far Can USD/JPY Fall? The U.S. dollar fell to a 7 month low against the Japanese Yen this morning following another barrage of weak economic data. Consumer prices fell, foreign inflows decreased and the UMich consumer confidence survey dropped to the lowest level since August 2009. On FX360.com, I talked incessantly in my daily report about how the data today was going to be weak and yesterday, I said USD/JPY was going to fall to at least 87. However now that it has broken below that point, the burning question on everyone’s minds is How Much Further Can it Fall? My updated target is at least 85.00 – The currency pair’s 14 year low. When USD/JPY reaches that point, expect Bank of Japan officials to cry uncle and attempt to talk down the Yen (and up the dollar). That will most likely create some 2 way risk in USD/JPY and stem the currency’s slide. Yesterday, Shirakawa already warned that they are watching USD/JPY closely. Enjoy the chart, enjoy the trade. USD/JPY: What Happens When the Interest Rate Spread Goes Negative? 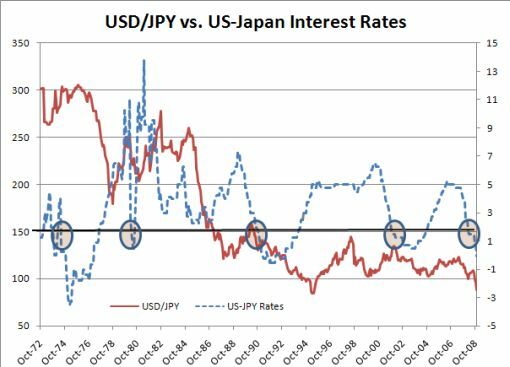 This is not the first time in recent history that US interest rates have fallen below Japanese levels. In the past 40 years, this has happened at least 5 times. The most recent time was in 1993. The following chart illustrates how USD/JPY performs whenever the interest rate spread between the US and Japan dips below zero. As you can see, it almost always precedes a sharp drop in USD/JPY that lasts can last for a number of months. The US dollar continued to hit new decade lows against the Japanese Yen and is inching closer to my 85 target. As you can see in the chart below, there is no support from here to 85. With US interest rates below Japanese rates, more adjustment is happening in USD/JPY. I do not think we will see much yen strength past 85. Although the Bank of Japan will not physically interven in the currency market anytime soon, verbal intervention may be on its way. 12.16.08 EUR/USD Headed to 1.43 (bottom of article) > HIT! 12.15.08 AUD/USD Headed to 0.70 > HIT! 12.11.08 EUR/USD Headed to 1.35 >> HIT! 12.08.08 EUR/GBP Headed to 0.90 >> HIT! 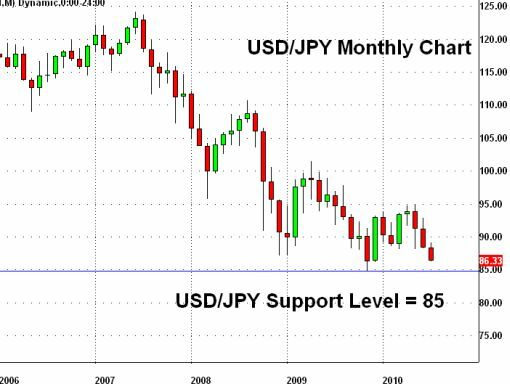 USD/JPY Hits 13 Year Lows: Will BoJ Intervene? 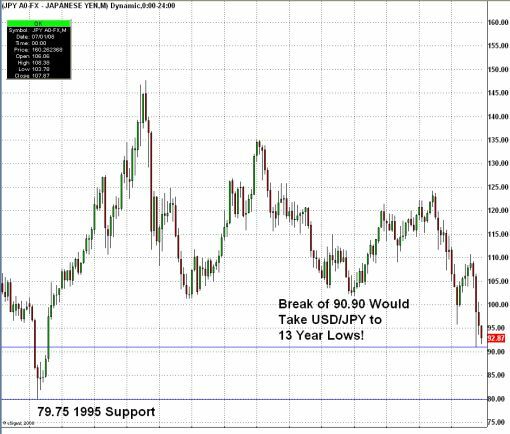 USD/JPY hit a 13 year low of 88.22 today after news that the bailout plan is not going happen before the new year. If you have been following my blog, I called for a move down to a new 13 year low Wednesday morning. At that time, USD/JPY was trading at 92.50-93.00. The currency pair has reversed violently after falling to 88.22. Will the Bank of Japan Intervene? A big question on everyone’s mind is Will the Bank of Japan intervene. Don’t expect BoJ intervention to happen anytime soon. As an export dependent nation, a strong currency is not in Japan’s best interest. However unlike in the past where the BoJ has intervened when USD/JPY fell below 105 and 100, we may not see any action by the Japanese government this time around. Since the problems are inherent in the US and the Eurozone, intervening at this time may be counterproductive for the Japanese. The only type of intervention that has ever worked is coordinated intervention. The BoJ will have a very tough time convincing the Americans to take any steps that would lead to further strength in the US dollar. The Japanese government needs to stand aside and allow the US and Eurozone governments to take their measures to spur growth and not strengthen the dollar for their own short term relief.